Today’s recipe is from Trapani, where they sometimes also add peas, which strikes me as a rare Sicilian ingredient slip-up. I personally love peas, but they are at their best when in similarly green company: simply dressed with butter and mint; in a Sicilian frittedda, with artichokes and broad beans; or cooked the French way with lettuce. What peas are most definitely not crying out for is fish and tomato sauce. More to the point, fish and tomato sauce are not crying out for peas. This is not a marriage made in heaven, believe me. So you’re getting the pealess version. It’s for your own good, trust me. What makes this recipe so obviously from Trapani is not so much the main ingredient (although they catch and eat tuna in boatloads on that side of Sicily), but the choice of pasta – busiate, which are basically coils, and are wonderful for trapping the tuna-laden sauce. If you can’t find busiate (and to be honest, you’d probably be hard pushed to find them on mainland Italy, let alone in your local supermarket), fusilli are a good substitute. As I said, this dish is a speciality of Trapani, and although you might find it on menus in Palermo, you’re unlikely to further afield, even in Sicily. It still sometimes surprises me that Italian food is not just regional but positively local. Even within Sicily, for example, there are noticeable differences between the traditional cuisines of Messina, Palermo and Trapani, and these in turn differ from those of cities inland, such as Enna. This is considered perfectly normal. Yet if a tourist came to England and inquired how traditional fish dishes in Bournemouth differed from those in Plymouth, he’d run the risk of being asked “you trying to be funny, mate?” before being thrown into the hypothermia-inducing waters of the Channel. Yet why Bournemouth, Plymouth or Whitby shouldn’t have their own local fish dishes still remains a mystery to me (and presumably to our hypothermic tourist). Actually, what’s even stranger is why England in general, with such a long coastline, has no real fish dishes at all. Fish is cooked on its own. If you’re lucky (though I’m stretching the definition of “lucky” here), it might come with a sauce, but that’s about as far as English inventiveness goes. The idea of combining fish with other ingredients seems not to have occurred to anyone. Our only achievement in this field is fish and chips. Delicious, certainly, but simply adding potatoes is hardly the height of culinary inspiration, especially since everything in England comes with chips anyway. Inventing fish and chips is a bit like inventing bread and cheese. Anyway, leaving behind us the woes of English fish cookery, let’s get back to today’s recipe. 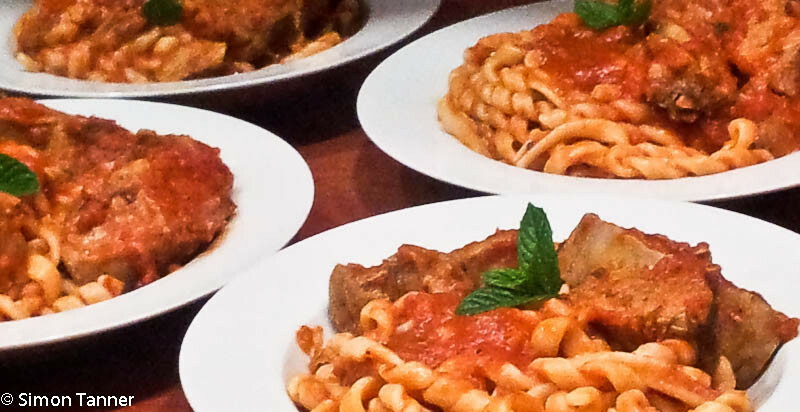 This is substantial fare, and could quite easily double up, like sugo di maiale, for a pasta and main course. Just fish out the chunks of tuna before mixing the pasta with the sauce, then serve the fish afterwards with some crusty bread or potatoes. The quantities I have given are geared to this approach, but if you simply want pasta with tuna, then 350g of tuna and 350g of passata will be enough, and you could dice the tuna rather than leaving it in large chunks. Put the tuna in a bowl of cold water for 30 minutes. This will take away the excessively bloody taste. In the meantime, in a saucepan, gently fry the onion until softened. Add the basil and fry for another minute. Add the tomatoes, a pinch of salt and pepper, and cook for ten minutes. Drain and pat dry the tuna. In a wide frying pan, heat some oil and gently fry the garlic and bay leaf. After a couple of minutes, remove the garlic. Turn up the heat and add the tuna, browning the chunks on all sides. Once well browned, deglaze the pan with the wine and cook off the alcohol. Add the tuna and the chopped mint to the sauce. Add 100 ml hot water and cook over a low-medium heat for 20 minutes, shaking the pan occasionally or stirring very gently (to avoid breaking the tuna up). Season to taste, adding some chilli flakes if you like. Meanwhile, cook the pasta and serve with the sauce, adding chunks of tuna on each plate or setting them aside to be served as a main course. With the combination of full-flavoured tuna and tomato sauce, a light red works just as well as a white wine here, and possibly better. This entry was posted in Fish, Pasta and tagged fish, pasta, seafood, tuna by hungryenglishman. Bookmark the permalink. Sounds a bit fishy to me…..boom boom!!! the old ones are always the best!